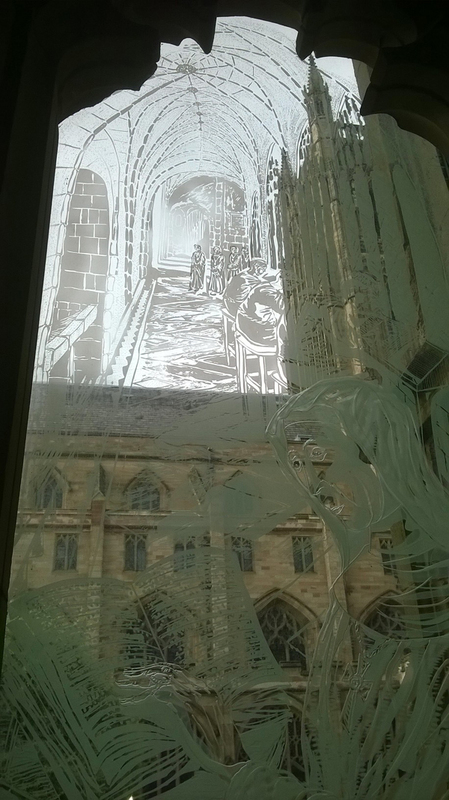 I recently walked around Worcester Cathedral because I had an hour to fill before my daughter’s gym class finished. I used to spend hours in there because I worked next door at Worcester Porcelain factory when I was 19. The lunch break was only 45 mins and I would eat a sandwich in the gardens and then sit inside the Cathedral. It was very peaceful and I was quite anti-social. The factory canteen was too noisy and I wanted to sit and think. I loved the tombs of King John and Prince Arthur Tudor. There is also lots of stained glass windows portraying of all the Kings and Queens of Great Britain and the people who influenced their reigns. Part of the reason I went was to look at these because they had been one of the many things that fueled my interest in writing my queen collection. 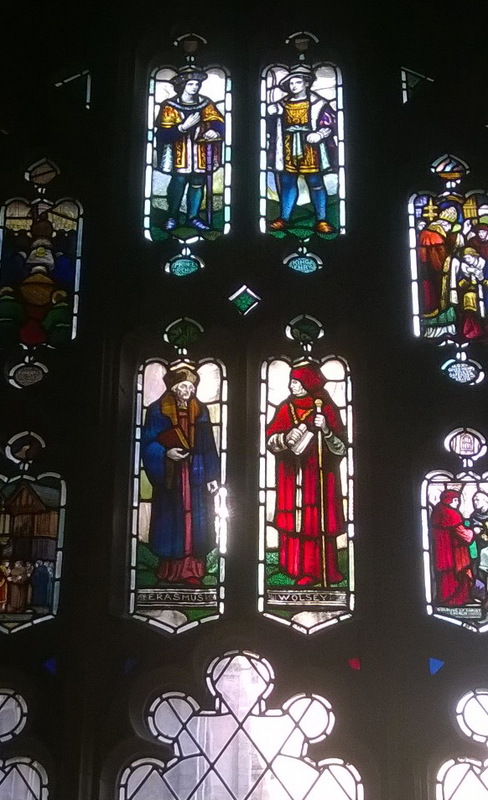 Here is the Prince Arthur window, with his brother Henry next to him (future King Henry VIII). Beneath them is Cardinal Wolsey and Erasmus. 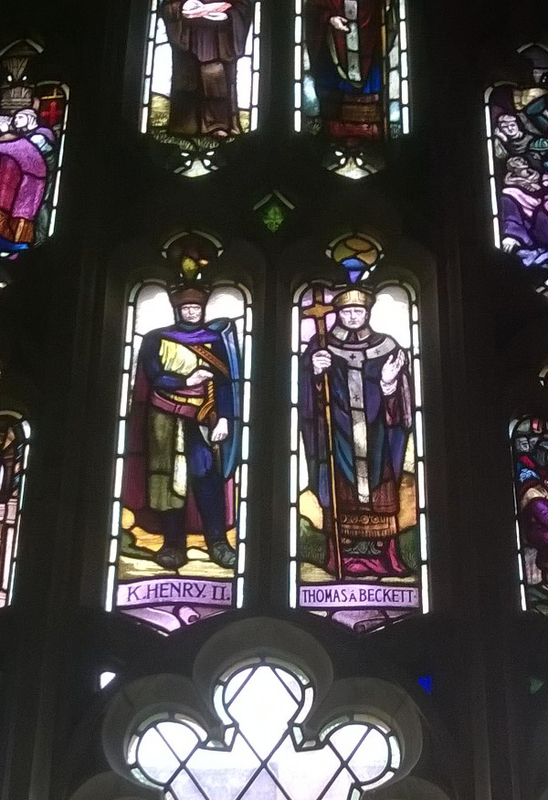 The other window pictured here features King Henry II and Thomas a Beckett. I am writing a poem about Henry’s walk to Canterbury cathedral at the moment. I have made him unrepentant! It shows how long it has been since I walked around the place because I had never seen the millennium window before. It was incredibly beautiful and I really appreciated the contrast between the etched, ethereal window which was placed next to the rich, darker colours of the stained glass beside it. 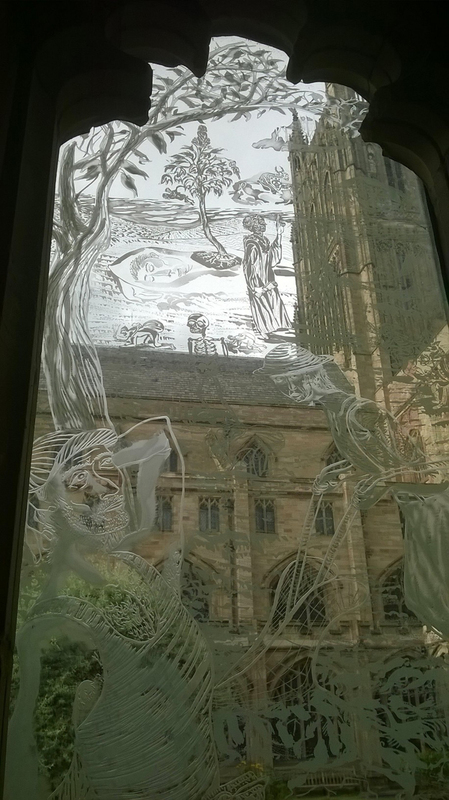 It allowed much more light to pass through it and the view of the cathedral behind the images was interesting. It was etched by the artist Mark Cazalet. This photo was taken from Mark Cazalet’s website.